cucumbers, food, gardening, pickle recipes, Sweet Midget Pickles, Whatever Happened to Dinner? Why would anyone collect 1-3 inch size cucumbers when the normal slicing cucumber size is more like 8-10 inches? Would I ever get enough to make a turn of sweet midgets? I first made these two years ago pondering whether they would turn out. Would anyone like them? Were they worth the effort? They are very sweet and oh so worth the effort. They soak up so much sugar that they become like little sweet candies with a pucker punch. This is the perfect year for making them again: rain has been frequent and plentiful enough that yards, trees, and roadsides are to me, much greener than normal, especially for August here in the Shenandoah Valley. My garden is just robust, and what started out to be six simple hills of cucumbers ended up being 10 when most of the starts that I bought had at least 2 plants per divider, and since some of my hills ALWAYS die off for unexplained reasons, I went ahead and plotted out a cucumber patch with 10 hills. I am drowning in cucumbers, especially after being away for a week. So it is no great loss to rob the patch of every little cuke I can catch and save in the 1-3 inch stage. And they do save up well. I just put them in a closed plastic bag in the fridge for 5-6 days as the stash mounts up. And what I discovered when I made them two years ago? They are so sweet they are like candy in a pickle, good enough to hoard, which is what I heard one recipient of one my jars did two years ago when I gave it as a hostess gift at a Christmas party we attended. “Richard hid the jar so no one else would eat them,” Janet told me. Loving that story, for sure. But you are either a fan, or you are not, so here’s the recipe and the method. This year I discovered I didn’t exactly have a container of “mixed pickling spice” in my cupboard like I thought so I also found a recipe (below, bottom) for making your own mixed pickle spice in a pinch. First Day. Place cukes in glass or stainless steel bowl or pan, cover with boiling water in morning. In afternoon, drain and re-cover with boiling water. This is pretty much what they look like after a one day soak. Second day. In morning, drain and cover with boiling water. In the afternoon, drain and cover with brine formed by adding salt to 3 qts. boiling water. Third day. In the morning, drain, rinse and prick cukes. I use an old fashioned 3 tined fork to prick the cucumbers with one tine. Toothpick works too. Make syrup using 1.5 cups sugar, 1.5 cups vinegar, and all spices. Bring to boil and pour over cukes. In the afternoon, drain syrup into pan. Add 1 cup sugar, and 1 cup vinegar. Heat to boiling and pour over cukes. Fourth day. In the morning, drain syrup into pan; add 1 cup sugar and ½ cup vinegar. Heat to boiling and pour over pickles. In the afternoon, drain into pan and add remaining sugar. Heat to boiling. Pour over pickles packed in jars. Leave ¼ inch headspace. Add ½ stick cinnamon to each jar. Process 10 minutes in boiling water. Makes 6-7 pints. Do you have another recipe for sweet midget pickles? 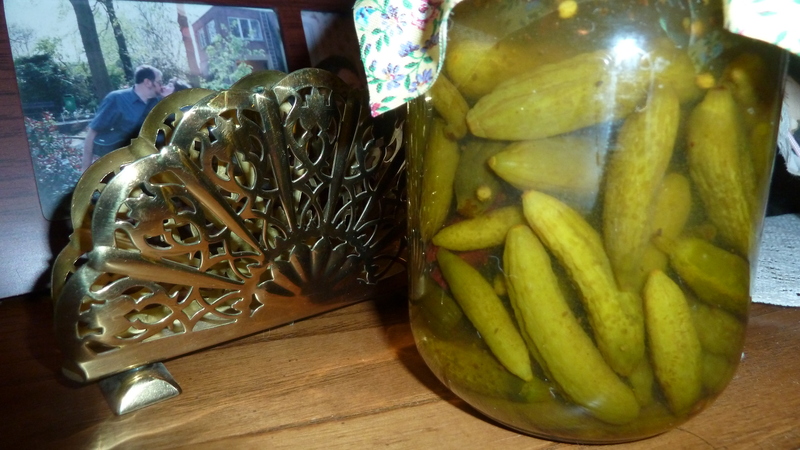 What’s a favorite pickle for your family? Thanks for sharing it! You are awesome. I wonder where that name gherkins comes from. I’ll have to look it up. I love that you could eat a whole jar. And bounce off the walls? There is something so incongruous about a vegetable being that sweet! I don’t know, it is just what we call them and what they are called in the Ball guide. And if you buy them pre made at the store. I was about three and I broke out in my first and worst case of eczema. I was apparently a very cracked and itchy mess, I am told. A gherkin is not only a pickle of a certain size but also a particular species of cucumber: the West Indian or Burr Gherkin (Cucumis anguria), which produces a somewhat smaller fruit than the garden cucumber (Cucumis sativus). Standard pickles are made from the Burr Gherkin, but the term gherkin has become loosely used as any small cucumber pickled in a vinegar brine, regardless of the variety of cucumber used. Gherkin is a term generally used to refer to a savoury pickled cucumber, particularly in the United Kingdom and Australia. Gherkins and commercial cucumbers belong to the same species (Cucumis sativus), but are from different cultivar groups. They are usually picked when 4 to 8 cm (1 to 3 in) in length and pickled in jars or cans with vinegar (often flavored with herbs, particularly dill; hence, “dill pickle”) or brine. The term can also be used to refer to the West Indian Burr Gherkin (Cucumis anguria), a related species, originally from West Africa and introduced to the West Indies, probably by the Portuguese. The Burr Gherkin, or badunga, cannot interbreed with the aforementioned Gherkin. It is edible and may be pickled, but must be picked when no longer than 4 centimetres (1.6 in) long, since it becomes bitter and spiny if allowed to grow larger. Gherkins are traditionally served cold, as cooked gherkins lose their intense flavour rapidly. 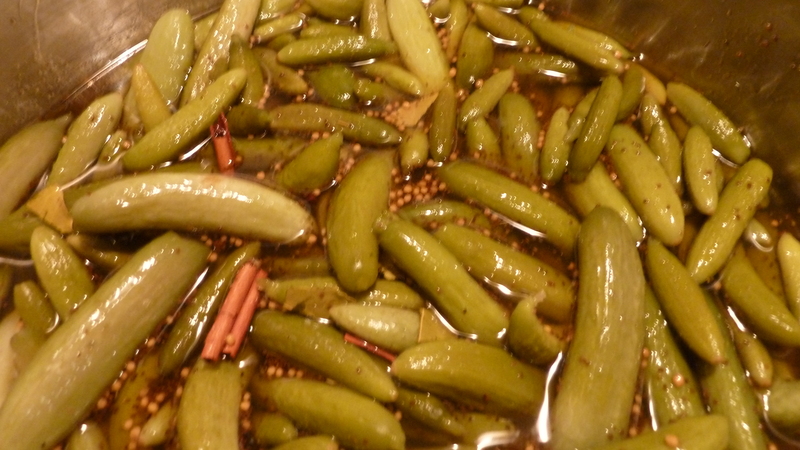 Pickled gherkins are served to accompany other foods, often in sandwiches. They are historically associated with Central European and, occasionally, Eastern European cuisine, but are now found more widely. Sometimes also called a cornichon (the French word for gherkin), they have historically also been called horned cucumbers, crumplings, and guerkins. 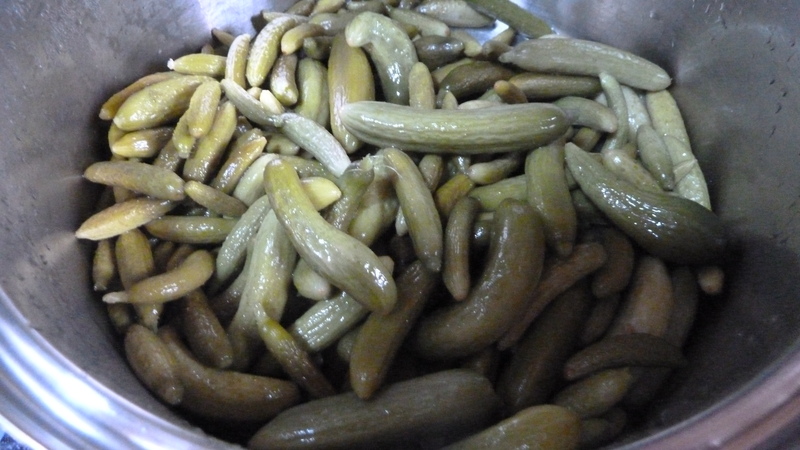 The gherkins sold in pickle mixtures are not C. anguria but rather are small pickled immature fruits of cultivars of the cucumber (C. sativus). A true gherkin has palmately lobed leaves with toothed edges, small flowers, and furrowed, prickly fruits about five centimetres (two inches) long that are borne on crooked stalks. Although its fruit is also pickled, the plant is frequently grown only as a curiosity. You recipe looks to be about a half batch of the recipe in the Ball Blue Book. That’s the one we use. Hmm, yes it is about a half batch. I’ve heard of the Blue Ball Book but do not have one. There is a Kerr guide and the Ball one. Nowadays I think they are the same company. I have s one pretty old and worn out versions but when the 100th anniversary edition came out in 2009 I bought us all one of those. I have all my grandma’s hand written recipe cards but they can be sketchy in detail. When we used to work along with her we just did as told. I do successfully use her watermelon rind pickle recipe and I like it better than Ball. Thanks CaroClare for the research. When I make my sweet gherkins I buy the little pickles from a neighbor. She lets me know when she has a batch for me and I make pickles that night. 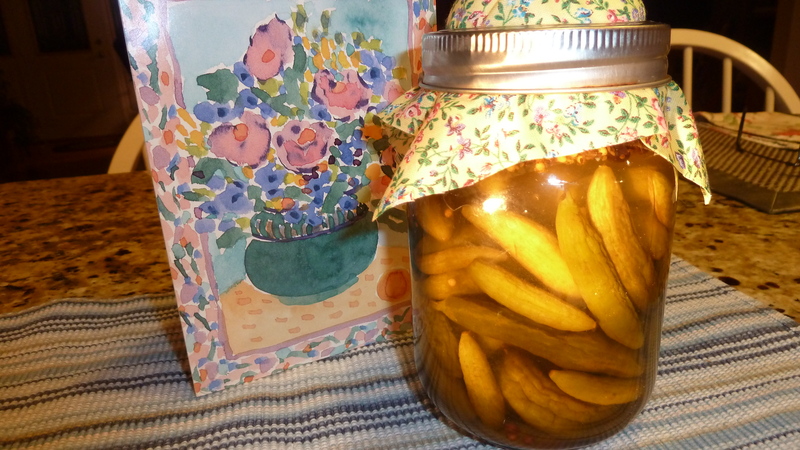 I grow my larger cucumbers for slicing and other pickles and relishes. I make three batches of sweet gherkins in a normal summer. How super sweet of your neighbor to collect them for you. I wonder if she collected them over days. I actually looked at our local farmers market whether anyone had some yesterday, I would have bought them to go with the ones I have so far. I only have enough for about a half batch. I’ll look for more tomorrow. It will be my second batch. Curious though how much your neighbor sells them for. Oh she picks them all at once and sticks them in my garage fridge if I am gone. She has a field and sells them at the various farmers markets. She and her husband both about 60 have been doing this for years. We barter…We have lots of gooseberry bushes and she picks what she feels is equivalent, she also likes the choke cherries. I’ve never made much use of those over the years. My grandma always did. These pickles are delicious! They are sure to disappear fast. I stored my little cukes in water in the fridge until the end of the week when I had harvested enough for a batch. The pickles turned out perfect. Very crunchy! Stored them in water–to keep them crunchy?! Glad they turned out great. Thanks for your comment.